Most couples tend to sink into ‘relationship hibernation’ as soon as they make it Facebook official; cocooned inside a world of Netflix and take-away menus. However, this doesn’t apply to Frankie and Wayne Bridge, who are bucking the trend and working to make romantic trips away a little less podge-inducing. Now, I for one have never been able to reconcile holidays with gruelling physical activity, but Frankie and Wayne have shown how this can actually bring you closer together as a couple. The sporty spouses have now created an action-packed itinerary for those travelling aboard Marella Cruise’s ship, the Marella Discovery. Perfect for those who get fidgety lying around on a sun-lounger all afternoon. As a couple, health and wellness is a really important part of our lives and we also love going on new adventures together, so when Marella Cruises asked us to create our own itinerary based on our personal interests, we jumped at the opportunity! We worked closely with the amazing staff on board to design an itinerary to inspire health and wellness regimes. We couldn’t believe all of the different activities we could do on the ship and ashore – we were spoiled for choice! Frank and I have such hectic lives at home – so making time for the two of us is so important – whether that’s working out together or going out for dinner. A lot of people think that going on holiday means you have to be inactive but actually it’s really easy to get active – especially on a cruise because there’s so many options. It’s also the perfect time to have a laugh together, which me and Frank always do. We live in a busy world where people aren’t necessarily able to find the time to unwind and de-stress. Going on holiday is the perfect time to truly reset and re-connect with ourselves and our loved ones. Getting away is proven to benefit your health and wellbeing, with research showing it can boost your immune system too. Cruising provides some of the most essential ingredients for people looking to get back in touch with their health and wellness regime. Being by the sea is a scientifically proven solution for stress and it is this environment which allows our body and mind to enter a heightened state of relaxation. Being near water and enjoying new experiences together are just some of the things that can boost the health of your body and mind. At Marella Cruises, we have something for everyone – to suit every taste. 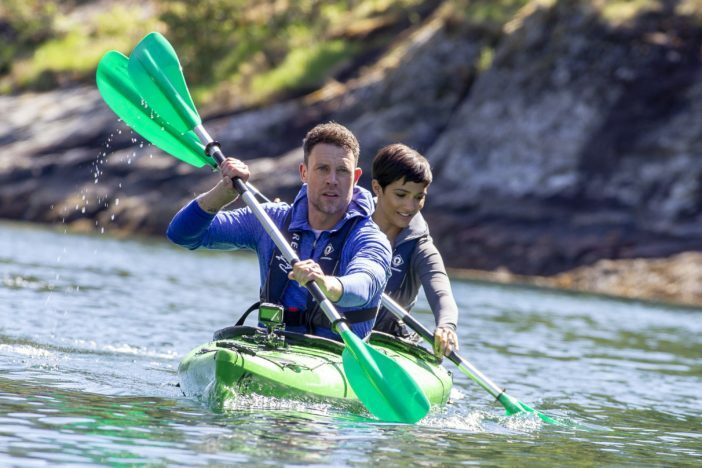 We are so confident we put everyone in the middle and provide the perfect holiday for all different types of people, that we decided to put this to the test by inviting Frankie and Wayne Bridge on board to design their own health and wellness itinerary. As a couple who have so many different passions, Frankie and Wayne were the perfect pair to curate a Marella Cruises itinerary which really showcases the diversity of activities we offer both on board and ashore. Will you and your other half be following in Wayne and Frankie’s energetic footsteps?